Slap Bracelets - Mega Bulk Pack of 50 Assorted Print Heart and Animal Slap Bands - Enjoy These Fun Pattern Hand-bands at School, Birthday Parties, Classroom Awards... and So Much More!!! Toy Cubby Slap Bracelets with Hearts and Animals Fun Pattern, bracelet measures 8.5 inches and comes with different animals and hearts pattern made perfectly to add more excitement and fun in your party, a well made product and slap closed easily, a perfect party favor that will surely loved by everyone. These bracelets fits well in children and also adults and there are a lot of things these bracelets can do, can be used to hold rolled papers, goody-bags stuffer, gift, Halloween and birthday party treats, prize box for students and perfect for any occasion like karaoke night, Halloween, Easter, 80's themed party and many more. 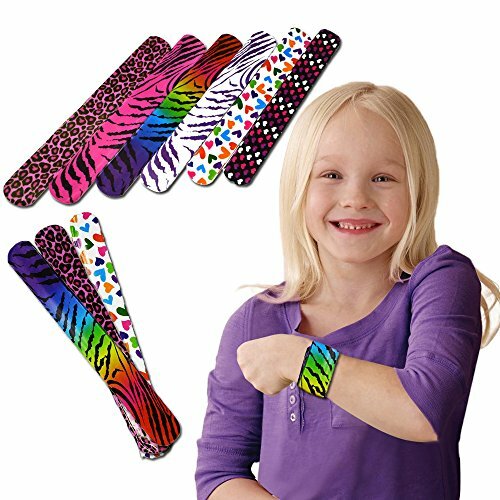 50 pcs Slap Bracelets with Heart and Animals Fun Pattern. Bracelet measures 8.5 inches and comes with different animals and hearts pattern, well made product and slap closed easily. Fits well in children and also adults. Can be used to hold rolled papers, goody-bags stuffer, gift, Halloween and birthday party treats, prize box for students. Perfect for any occasion like karaoke night, Halloween, Easter, 80's themed party and many more. If you have any questions about this product by Toy Cubby, contact us by completing and submitting the form below. If you are looking for a specif part number, please include it with your message. Paw Print Party Favor School Mega Bulk Supplies Animal Lover Themed Pack includes Pencils, Erasers, Stampers, and Balloons!